2017 Wright State graduate Tyler Rose benefited from the Student Government Scholarship. Tyler Rose ’17 still remembers the feeling of surprise — and relief — when he learned that he was a recipient of the Student Government Scholarship. For Rose, the benefits of being awarded a scholarship were more than just financial. The scholarship was also a validation of his commitment to his studies and his leadership as president of Sigma Phi Epsilon fraternity. Since its inception in 2004, the Student Government Scholarship has been helping student leaders across campus make their dreams of a college education a reality. As the amount of the scholarship awards began to vary over the years, Student Government leadership and alumni decided they wanted to make more of an impact on future generations of Wright State students. In 2015, they launched a fundraising initiative to raise $10,000 to endow the Student Government Scholarship. By creating an endowment, the scholarship would live in perpetuity and generate annual scholarship awards for exceptional student leaders. Three years later, the Student Government Endowed Scholarship is the first endowed scholarship established by a student organization at Wright State. “This has been a true student and alumni collaboration. We have all worked very hard, and I credit Student Government leadership. They really got us over the finish line by stepping up and engaging current students and staff on campus,” said Jason Lansdale ’00, who helped lead alumni fundraising efforts for the scholarship and is secretary to the Wright State Alumni Board of Directors. The success of the scholarship has personal meaning for Lansdale, who served as chief justice for Student Government when he was a student in the late 1990s. “We saw Student Government alumni from across the years step up and contribute to ensure this scholarship hit the initial $10,000 mark for endowment,” he explained. Additionally, Student Government alumni have been working with current Student Government Association (SGA) administrations in a mentorship capacity by hosting conference calls and being available to discuss current SGA challenges. “The endowment of this scholarship is one of several strategic ways our Student Government alumni are giving back and helping current campus leaders,” said Lansdale. Holley Mapel, who served as SGA vice president during the 2017–2018 academic year, looks forward to making her first gift to the newly endowed scholarship. “I know for me, I have been positively impacted by the Wright State University community and supported with scholarships so much that I hope to be a life-long contributor,” she said. 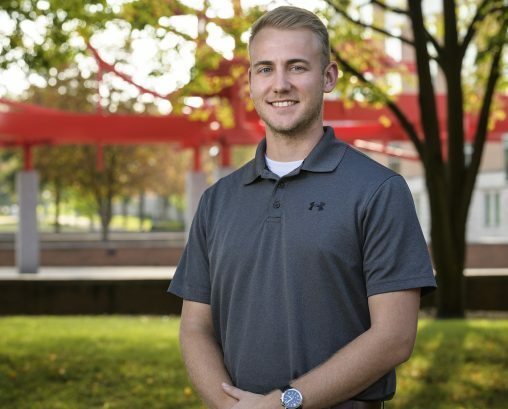 Former scholarship recipient Tyler Rose, who currently works as an analyst in the marketing analytics department at Speedway’s corporate headquarters, also hopes to help out one day.